Today you’re gonna learn how to paint over stripes the right way! YAY! If you simply get out your roller and paint over them, you’re gonna be sorry because you’re still going to be able to see them even if you have great paint coverage! Why? Because when you taped them off and painted them, you created a teeny tiny ledge of paint that when painted over, will stick out like a sore thumb. Believe me. What you’ll want to do is take a sheet of sandpaper or a sanding block and sand down that little ledge so the wall is smooth underneath. If you have textured walls (I don’t in this house) you will sand lightly to remove the ledge but keep most of the texture intact so you don’t have to retexture the wall. Get it? 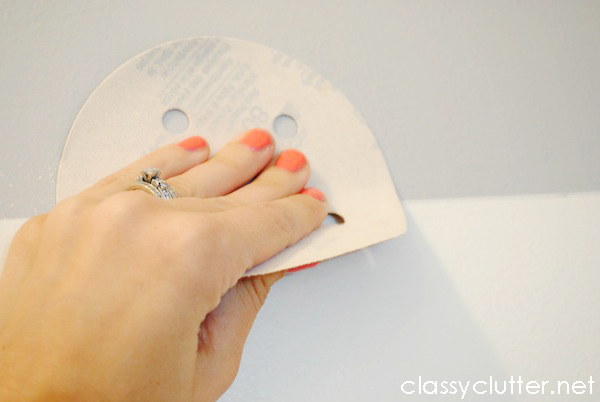 Then, when your wall is perfectly smooth, you’ll wipe down the wall to remove any sanding debris and once it dries, THEN you can take your roller and paint as usual! Easy right? Don’t skip the sanding, you’ll be sorry. It should look like this ^ when you’re done! 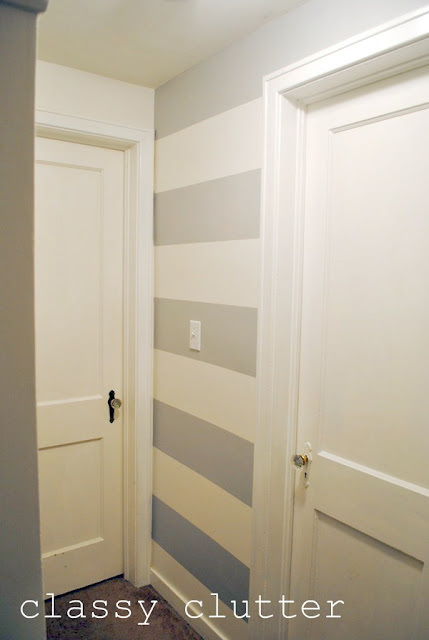 To this DIY Striped Wall.. Tada! Fresh, minty goodness! 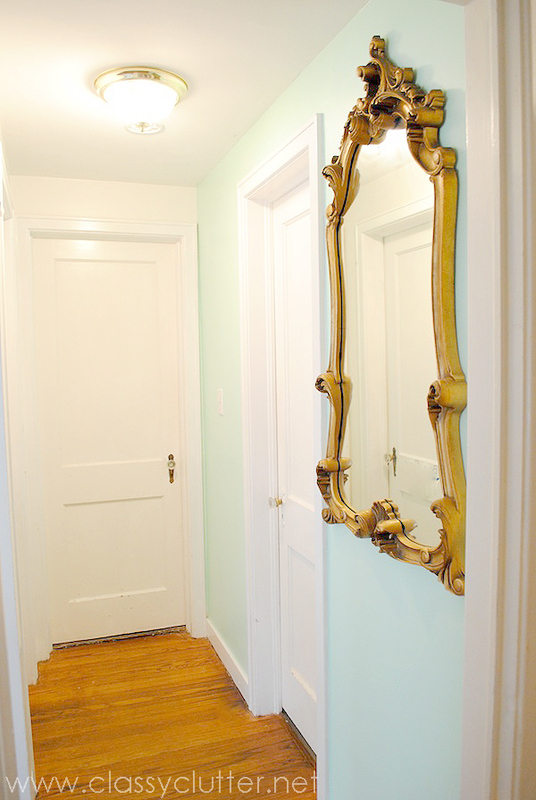 What do you think about my new minty hallway!? I used Savannah’s perfect mint color but a little lighter. (Somewhere in between Behr’s Tropical Dream and Canton Jade – find it at The Home Depot), it’s the perfect mint tone. That Savannah sure knows her stuff. What do you think friends? Are you loving mint right now? I think you should try stripes with more bright colors next time you feel like moving back to stripes again. I love that minty wall! I think it looks stunningly beautiful and I want it haha! Funny you did this post. I painted stripes in our nursery and was thinking the other day if I ever want to paint over them, more prep work needs to be done. Sanding is the perfect solution. I love mint! It’s such a great color. 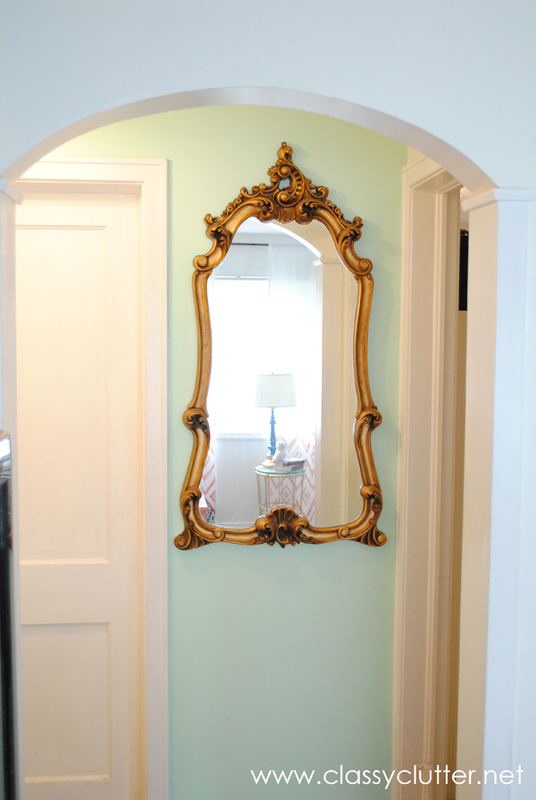 Your gold mirror looks great against the mint walls. Love it! 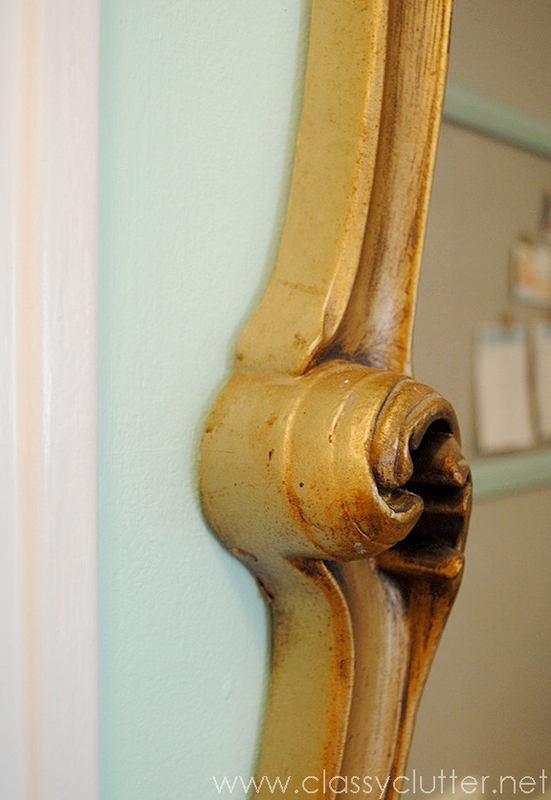 I am painting my office this weekend and looking for that EXACT color! So far I’ve paint tested Seafoam Pearl and Window Pane (a shade up from sea foam pearl) but they are not turning out minty. Did you have them mix Tropcial Dream & Canton Jade together?